This essay begins a series about self-improvement. The next essay in the series is about changing habits. The final essay discribes how to be a chooser even when reactive. What motivates us to improve ourselves or our situations? It can be helpful, in a very general way, to think about where our personalities fall along two spectra. The first is about how much initiative we take. Proactive people approach tasks like a swing dance lead: they supply the energy and momentum, and organize what will happen. They make very specific plans. They focus on schedules and effort. Reactive people approach tasks like a swing dance follow: they react to external energy and momentum and fill it with their personal style. They make vague plans. They focus on emotion and bargains. No one is completely proactive or reactive. Moreover, everyone is more proactive about the activities they most enjoy. Yet it is helpful to realize which is our dominant behavior most of the time. The second spectrum is about where we invest our gains. 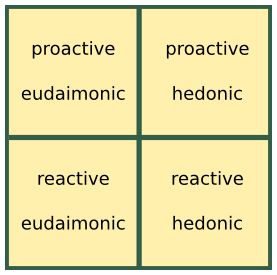 Eudaimonic people think most about overall wellbeing. They want normal moments to have as much peace and contentment as possible. They often make choices that arrange their life to have stable happiness. A eudaimonic person might splurge on an expensive sofa or granite kitchen counters, so the daily grind is eased by having the places they spend a lot of time as functional and luxurious as practical. Hedonic people think about specific comforts and discomforts. They want special moments to be as wonderful and memorable as possible. They often make choices to enjoy immediate pleasures or avoid immediate anxiety. A hedonic person might splurge on an expensive vacation, so the daily grind is eased by special memories of luxury and pleasure. As before, it is helpful to realize how we tend to be dominant in one of these ways. Thus we have four possibilities for what type of people we usually are in most situations..
All four types of students can motivate themselves, complete the homework, and succeed in math. But how they do it is very different! I will set aside specific times and places to study each week. I will make myself do the homework. I know that if I arrange my week in a way that makes homework a priority then I will not fall behind in class. Falling behind causes trouble. I believe I can pass any class if I never fall behind. I will keep aware of my potential resources: office hours, tutoring, the library's collection of the textbook publisher's videos for each section, online math videos, my roommate's friend who is great at math, etc. If I ever start falling behind I will pick one more resource to start using. I will compare my notes with those of some classmates. That will help me learn what kind of math notes help me most. If someone else seems to be a much better note taker than I am, I will ask if they can teach me their way. I will set aside specific times and places to study each week. After each study time I will schedule getting together with friends. I will make myself do the homework. It will be easier to get the homework done while I am looking forward to having fun afterwards. I recognize that discouragement is normal and temporary. I will push through any discouragement. If I need to bribe myself by eating a chocolate chip after each homework problem, so be it. I am afraid to ask questions during class. I'll ask one each week. If I don't then I will go up to my teacher after class on Friday and apologize for not asking my questions. That would be horrible, so I know I'll ask one question. Probably on Mondays to get it done with. I believe I can succeed. I can reach my goals. This homework intimidates me but I will show it who is boss! When I finish a homework assignment I will celebrate using social media so my friends can say 'good job!' and I will feel happy. I will join a study group so the expectation of attending it will keep me from procrastinating. Also, in the study group I will sometimes be the person who gives to others hints and help. That will make me feel good. After a test I will get some tutoring from my friend who is great at math. If I do well on the test, her congratulations will make feel good. Knowing she will be looking at my tests' scratch work will motivate me to write my step-by-step answers nicely, which will itself help my test scores. I will take great notes. If there is someone in my class who needs a copy of someone's notes (I know disability services sometimes recommends this to people) I will volunteer. That will make me feel useful and happy. And I'll have good notes! I realize I am afraid to ask questions during math class. I made a bargain with my roommate: whichever of us asks the smaller number of questions in our math classes each week has to clean the bathroom that weekend. This homework intimidates me but I will show it who is boss! Each day I will not eat deserts until my homework is done. I know that listening to music slows me down, but after I complete three-quarters of the problems I will turn on my music anyway so I finish in a better mood. I will mark the tests on my calendar with the big red words "math test!". A little fear helps prevent procrastination. I am going to worry about the tests anyway. I might as well use that worry to help get my homework done on time. I know I have some strengths. I am organized. I can focus when studying. I passed the previous math class. I like going to class. I want to do well. When I feel discouraged I will think about these strengths. I realize I am afraid to ask questions during math class. When I do ask questions I will applaud my bravery. I might even do a little dance after class.